Background: Amphotericin B (AmB), a polyene antibiotic used for the treatment of fungal and leishmanial infections is virtually insoluble in water and exhibits severe toxicity. AmB has been conjugated to various soluble polymers for improving its solubility and reducing its toxicity. Conjugating AmB to a polysorbate surfactant such as polyoxyethylene sorbitan monolaurate (Tween 20), was examined to improve its solubility and reduce its toxicity. Methods: AmB was coupled to Tween 20 via carbamate linkage at 15 and 30 wt% concentrations in high yield by activating the hydroxyl groups of the surfactant using p- nitrophenyl chloroformate. The conjugates were characterized by using 1H NMR, IR, UV and HPLC analysis and were examined for their toxicity, and anti-fungal and anti-leishmanial activities in vitro. Results: Tween-AmB conjugates were soluble to the extent of 10 mg/mL in water, showed improved critical micelle concentration in comparison with AmB, exhibited negligible hemolytic potential even at a concentration of 1000 µM and were not toxic against human embryonic kidney cell line (HEK293T) at similar concentrations. 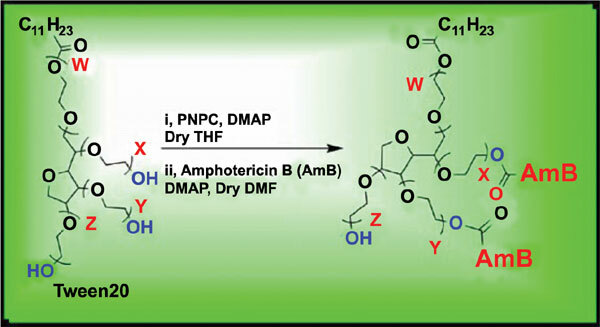 The conjugates showed potent anti-fungal activity against Candida albicans, Candida parapsilosis and Cryptococcus neoformans and anti-leishmanial activity against intramacrophage amastigotes of Leishmania donovani. Conclusions: Tween 20 is a surfactant approved by the US FDA as an additive in food and pharmaceutical preparations. Synthesis of drug conjugates with surfactants such as Tween-20 could open up new opportunities to improve the solubility of many drugs, reduce their toxicity and could possibly target the brain as polysorbates known to facilitate nanoparticulate systems to cross the blood-brain barrier. Amphotericin B, Tween 20, Tween 20-amphotericin conjugate, anti-fungal, anti-leishmanial, hemolysis.